Following up on last week's first look at the mighty Visthowla Legion big werewolf infantry we now put them on general release. These 45mm tall partially modular white metal 28mm scale miniatures were sculpted by Sam Croes and are part of the Ferach Empire. 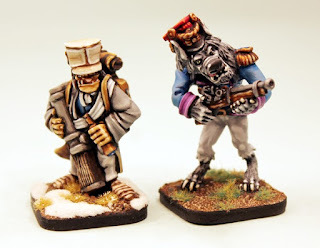 If you want to see these plus all of the other codes in the Dutchy of Coltz range for Flintloque and Slaughterloo click HERE otherwise read on and remember to click to download your free Uniformation article too. Often the mere mention of the name of the Visthowla Legion makes enemies flee from battle, these are the crack Infantry of the Werewolves. Visthowla towering over their comrades armed with the best weapons and led by the best Officers. There are several legions each serving where most needed, some with the Grande Armee du Norde with almost all of their original numbers still intact. 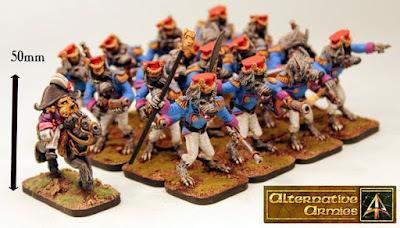 This 28mm scale white metal miniatures skirmish code gives you the big werewolf soldiers of the Visthowla Legion who fight in the service of the Emperor Mordred of the Ferach Empire against the Undead of the Witchlands. 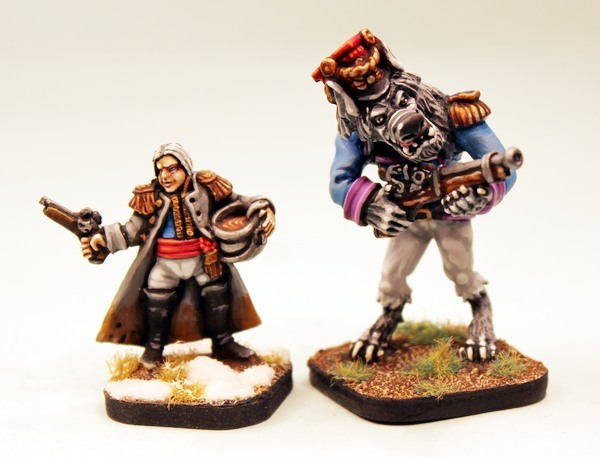 These are partially modular and posable miniatures which once assembled stand around 45mm tall and supplied with 30mm square cartouche bases. Every pose is supplied with one of two different bodies and one of different three heads. There is an officer with sword and pistol (1), a musician with drum and drum stick (2), standard bearer with pole and Coltzen Musket (3), sergeant pointing with Coltzen Musket, trooper marching with Coltzen Musket (5) and trooper cradling Coltzen Musket (6). Note that if you order multiples of a pose we will ensure a variety of body and heads within that. Choose from a skirmish set of all six poses and from the numbered single poses of the six. You can also select pro-painted and based. Go HERE. This 28mm scale white metal unit code gives you a full sixteen strong big werewolves of the Visthowla Legion for Slaughterloo unit. As with the skirmish set this contains all six partially modular and posable miniatures (Officer, Musician, Standard, Sergeant, Trooper, Trooper) and then an equal mix of the pieces needed for ten more troopers armed with a Coltzen Musket. Supplied with resin cartouche bases. You can also select pro-painted and based. The unit gives you an additional saving off single and skirmish set options. Go HERE. 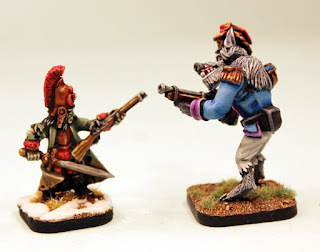 Those of you who play Slaughterloo or Flintloque with the Death in the Snow book will be familiar with the Witchlands campaign and the titanic of the Grande Armee du Norde against the Undead of the Dark Czar. You can download a free Uniformation article from our dropbox by clicking HERE. 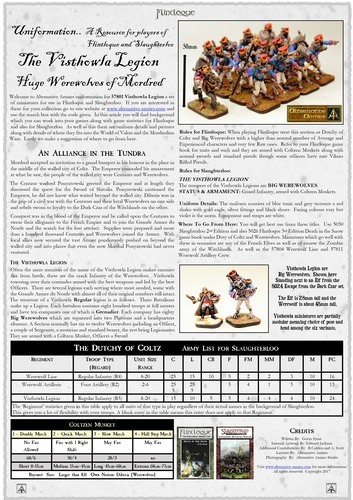 This one page article gives you background as well as statistics and more for the Visthowla Legion in Flintloque and Slaughterloo as well as their big hitter Coltzen Musket too. Above are some scale pictures of our 57801 Visthowla Trooper cradling musket (6) with some of the characters from the 5024 Escape from the Dark Czar starter set for Flintloque. 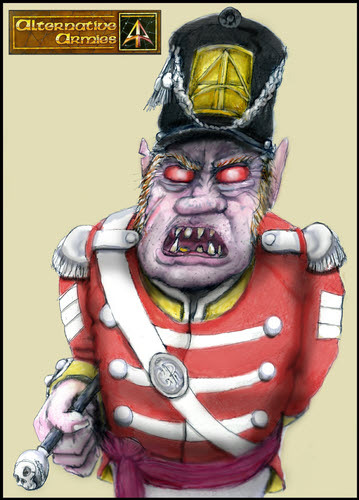 As you can see it stands taller than an Ogre and a lot larger than an Elf or Zombie at 50mm from clawed feet to shako. This is our main release for July for the World of Valon but fret not for there is more to come later this month. 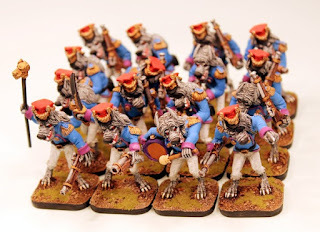 We have another great hobby article about playing Flintloque written by Andy Jefcoate following up on last month. We have another release too which will add a character to your Ferach Armee. Watch out for these as the month progresses. 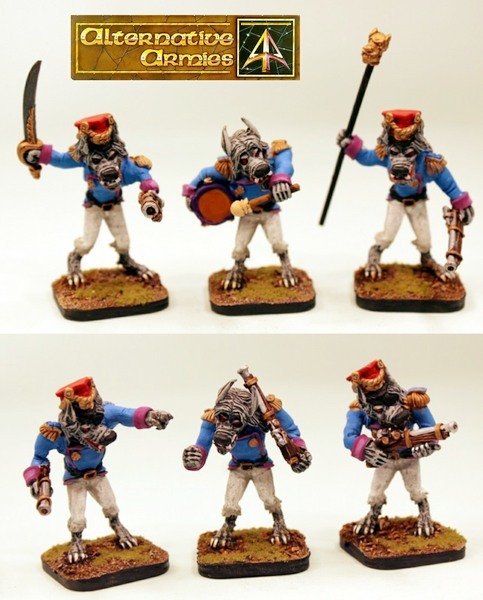 Alternative Armies wants to thank you for kind words about Flintloque and the latest additions to the range.